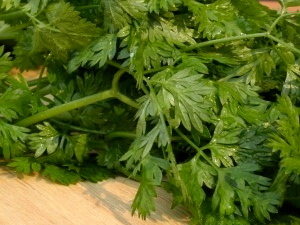 Every time I spot chervil’s feathery, kelly-green leaves at my farmers’ market, I feel a silly little rush of glee. Perhaps it’s because chervil makes itself available to me only a few temperate months a year, or because it signals the arrival of the rest of spring’s luxuries. Regardless, I can scarcely get enough of it before the heat scares it away until fall. Chervil isn’t widely adored in the U.S., but it’s a fixture in French kitchens, where it’s a component of the classic fines herbes quartet (chervil, chives, parsley, and tarragon). But where parsley is zippy and bold, chives onion-tinged, and tarragon aggressively seductive, chervil offers a simple, grassy clarity and just a tease of delicate, anise-tinged sweetness. Because chervil is so soft-spoken, it needs to be used in quantity and in company with similar mild flavors; otherwise, its voice will be lost. 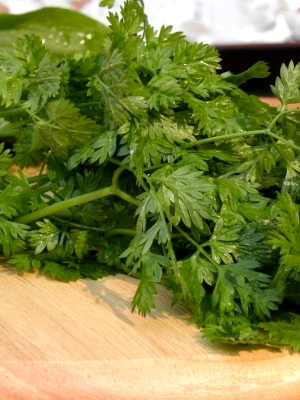 Likewise, too much heat will trash chervil's flavor, so add it only in the last few minutes of cooking. Still, so long as flavors stay low-key, chervil is remarkably flexible. This time of year, I like to snip chervil leaves and fennel fronds into a salad of mixed lettuces and shower it over a soup of sorrel or leeks. I also use it to finish a spring-vegetable ragout: young radishes, turnips, carrots, spring onions, and peas sautéed in a bit of butter and white wine just until tender, then finished with a flourish of finely chopped chervil. One of my favorite applications for chervil, though, is even simpler: a generous teaspoon or two, along with a pinch of sea salt, folded into a few farm-fresh scrambled eggs just as I bring the eggs away from the heat. Add some good crusty bread and a green salad, and there's lunch, courtesy of the season. Read Cindy Burke's blog post about spring chives.